There was once a little brother who took his Sister by the hand, and said, “Since our own dear mother’s death we have not had one happy hour; our stepmother beats us every day, and, when we come near her, kicks us away with her foot. Come, let us wander forth into the wide world.” So all day long they travelled over meadows, fields, and stony roads. By the evening they came into a large forest, and laid themselves down in a hollow tree, and went to sleep. When they awoke the next morning, the sun had already risen high in the heavens, and its beams made the tree so hot that the little boy said to his sister, “I am so very thirsty, that if I knew where there was a brook, I would go and drink. Ah! I think I hear one running;” and so saying, he got up, and taking his Sister’s hand they went to look for the brook. 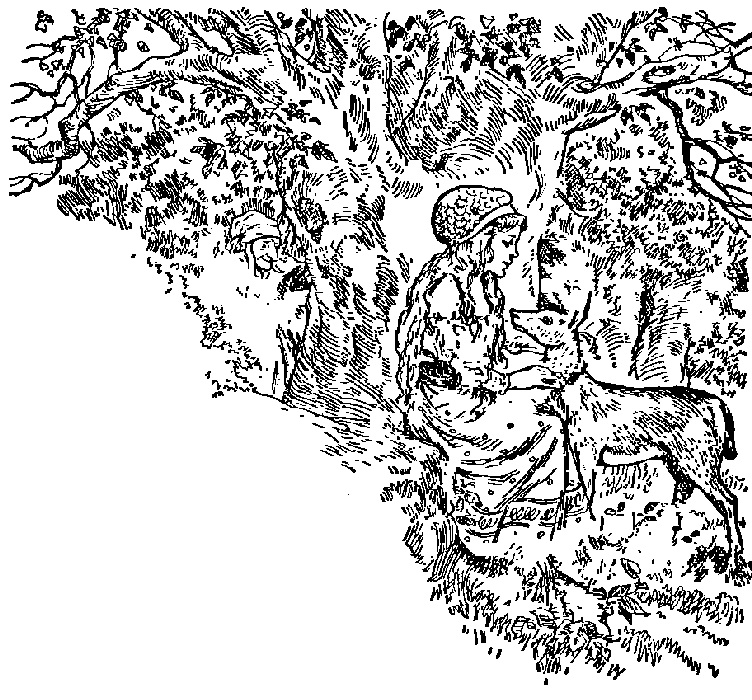 The wicked stepmother, however, was a witch, and had witnessed the departure of the two children: so, sneaking after them secretly, as is the habit of witches, she had enchanted all the springs in the forest. Presently they found a brook, which ran trippingly over the pebbles, and the Brother would have drunk out of it, but the Sister heard how it said as it ran along, “Who drinks of me will become a tiger!” So the Sister exclaimed, “I pray you, Brother, drink not, or you will become a tiger, and tear me to pieces!” So the Brother did not drink, although his thirst was very great, and he said, “I will wait till the next brook.” As they came to the second, the Sister heard it say, “Who drinks of me becomes a wolf!” The Sister ran up crying, “Brother, do not, pray do not drink, or you will become a wolf and eat me up!” Then the Brother did not drink, saying, “I will wait until we come to the next spring, but then I must drink, you may say what you will; my thirst is much too great.” Just as they reached the third brook, the Sister heard the voice saying, “Who drinks of me will become a fawn—who drinks of me will become a fawn!” So the Sister said, “Oh, my Brother do not drink, or you will be changed into a fawn, and run away from me!” But he had already kneeled down, and he drank of the water, and, as the first drops passed his lips, his shape took that of a fawn. At first the Sister wept over her little, changed Brother, and he wept too, and knelt by her, very sorrowful; but at last the maiden said, “Be still, dear little fawn, and I will never forsake you!” and, taking off her golden garter, she placed it around his neck, and, weaving rushes, made a girdle to lead him with. This she tied to him, and taking the other end in her hand, she led him away, and they travelled deeper and deeper into the forest. After they had gone a long distance they came to a little hut, and the maiden, peeping in, found it empty, and thought, “Here we can stay and dwell.” Then she looked for leaves and moss to make a soft couch for the Fawn, and every morning she went out and collected roots and berries and nuts for herself, and tender grass for the Fawn. In the evening when the Sister was tired, and had said her prayers, she laid her head upon the back of the Fawn, which served for a pillow, on which she slept soundly. Had but the Brother regained his own proper form, their lives would have been happy indeed. 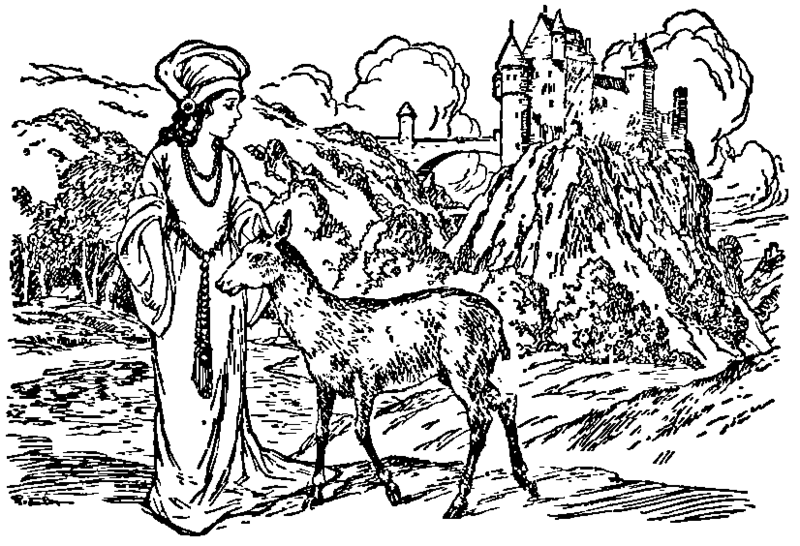 The King took the beautiful maiden upon his horse, and rode to his castle, where the wedding was celebrated with great splendor and she became Queen, and they lived together a long time; while the Fawn was taken care of and played about the castle garden. The wicked stepmother, however, on whose account the children had wandered forth into the world, had supposed that long ago the Sister had been torn into pieces by the wild beasts, and the little Brother in his Fawn’s shape hunted to death by the hunters. As soon, therefore, as she heard how happy they had become, and how everything prospered with them, envy and jealousy were aroused in her wicked heart, and left her no peace; and she was always thinking in what way she could bring misfortune upon them. Her own daughter, who was as ugly as night, and had but one eye, for which she was continually reproached, said, “The luck of being a Queen has never happened to me.” “Be quiet, now,” replied the old woman, “and make yourself contented: when the time comes I will help and assist you.” As soon, then, as the time came when the Queen gave birth to a beautiful little boy, which happened when the King was out hunting, the old witch took the form of a chambermaid, and got into the room where the Queen was lying, and said to her, “The bath is ready, which will restore you and give you fresh strength; be quick before it gets cold.” Her daughter being at hand, they carried the weak Queen between them into the room, and laid her in the bath, and then, shutting the door, they ran off; but first they made up an immense fire in the stove, which must soon suffocate the poor young Queen. When this was done, the old woman took her daughter, and, putting a cap upon her head, laid her in the bed in the Queen’s place. She gave her, too, the form and appearance of the real Queen, as far as she was able; but she could not restore the lost eye, and, so that the King might not notice it, she turned her upon that side where there was no eye. When midnight came, and every one was asleep, the nurse, who sat by herself, wide awake, near the cradle, in the nursery, saw the door open and the true Queen come in. She took the child in her arms, and rocked it a while, and then, shaking up its pillow, laid it down in its cradle, and covered it over again. She did not forget the Fawn, either, but going to the corner where he was, stroked his head, and then went silently out of the door. The nurse asked in the morning of the guards if any one had passed into the castle during the night; but they answered, “No, we have not seen anybody.” For many nights afterwards she came constantly, but never spoke a word; and the nurse saw her always, but she would not trust herself to speak about it to any one. “How fares my child! how fares my fawn? At these words the King could hold back no longer, but, springing up, cried, “You can be no other than my dear wife!” Then she answered, “Yes, I am your dear wife;” and at that moment her life was restored by God’s mercy, and she was again as beautiful and charming as ever. She told the King the fraud which the witch and her daughter had practised upon him, and he had them both tried, and sentence was pronounced against them. The little Fawn was disenchanted, and received once more his human form; and the Brother and Sister lived happily together to the end of their days.